Steamship Company, who has sent its vessels MV James R. Barker and MV ed; and as is often the case when imple- ers to further develop sodium hydroxide fourth vessel — its second 1,000-foot- Lee A. Tregurtha were out? tted with menting any new technology, challenges supply on the Great Lakes. Following the successful implementa- then travels through a droplet separator ensure safety and train our crew around has ironed out many of the wrinkles and tion on Oberstar, which saw better-than- before a clean plume of white steam is caustic soda? How do we treat it? How has adapted to minimize potential im- expected results, Interlake decided to discharged. do we deal with the wastewater and en- pacts. BELCO has even modi? ed the continue the installs and is now on its Barker said, “the scrubbers are not in- sure we are complying with all laws and units over time and altered various com- fourth of ? ve planned scrubber retro? ts, expensive,” but for Interlake, they offer regulations?” ponents to help improve performance. having most recently sent its 1977-built a greater bene? t for long-term operating Interlake worked with partners “It’s a big job and more complicated self-unloading bulker MV Mesabi Min- cost. 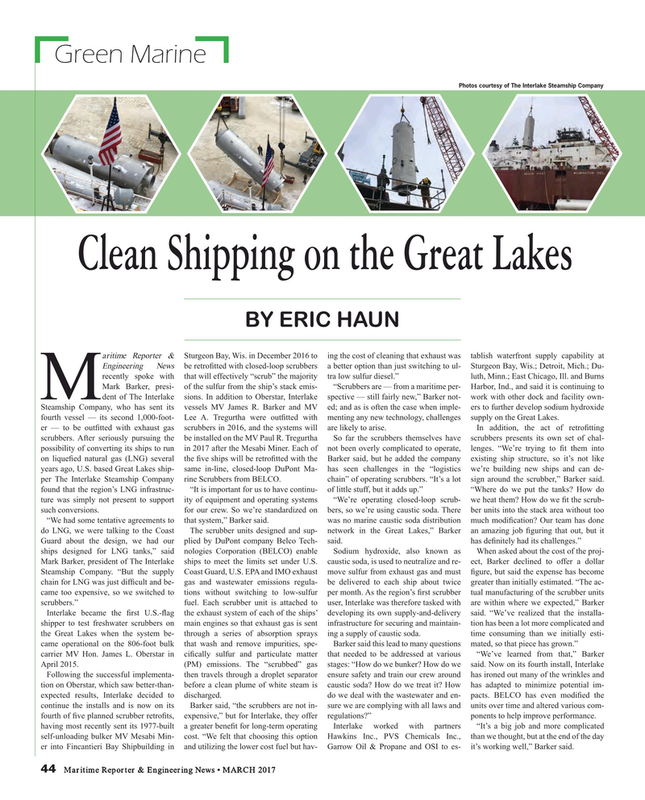 “We felt that choosing this option Hawkins Inc., PVS Chemicals Inc., than we thought, but at the end of the day er into Fincantieri Bay Shipbuilding in and utilizing the lower cost fuel but hav- Garrow Oil & Propane and OSI to es- it’s working well,” Barker said.